The summer is getting to the end but Orange35 Team will not let it go without the presents. Everybody will miss the sun on the seaside and happy days during the vacation. However, there is a simple way to make the summer a bit longer. 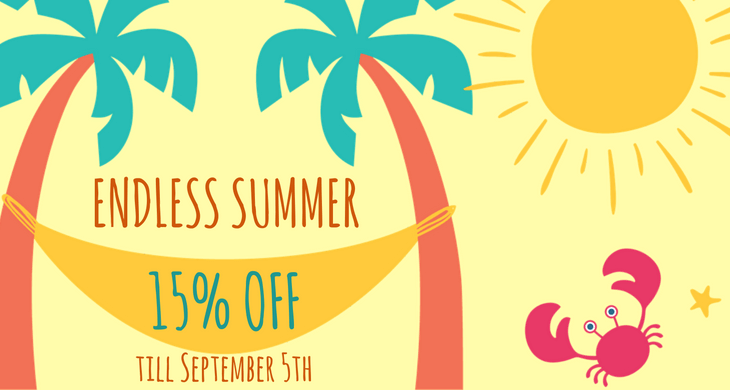 Orange35 provides you with an Endless Summer Sale and offers 15% Off All Products from the store. Take a chance to buy high-end Magento Extensions at the reduced price and enhance your online store with new features. To get the discount use the promo code below during the checkout process. To use the code, select desired Magento Extensions or other products from the store and add them to the cart. Then, copy and paste the code into the corresponding field on the top right of your shopping cart page. The coupon code will be valid until the 5th of September, 2016. So, you have a plenty of time to get the offer and buy Magento Extensions you like. Also, keep in mind that you will also get 90 days of Free Support with every product from Orange35 Store. Furthermore, this period can be easily extended up to 360 days by choosing the proper option during the checkout. So, hurry up to make your summer a few days longer with an Endless Summer Sale. Also, if you have some questions, please, feel free to contact Orange35 Team. One of our Support Managers will reply within a few hours.